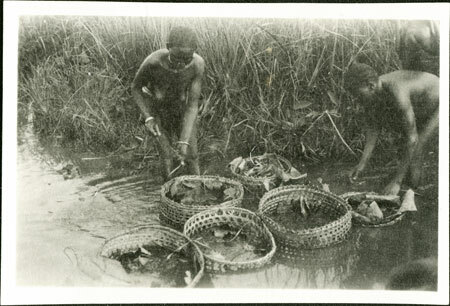 Women immersing baskets of malted eleusine grain partially wrapped in banana leaves, an initial stage in the brewing of a beer type known as gbangara, a reddish-coloured eleusine brew. It is then spread out in the sun to germinate. Morton, Chris. "Zande women emersing grain for beer brewing" Southern Sudan Project (in development). 03 Jan. 2006. Pitt Rivers Museum. <http://southernsudan.prm.ox.ac.uk/details/1998.341.254.2/>.